(1 Box: 30 Tablets) - Tryptochron® is a unique formulation based on the science of chronobiology that helps your body maintain healthy serotonin levels, without negative side effects. Approximately one in eight people have difficulty maintaining a healthy mood, and experience phases of sadness, sensations of inner emptiness, feelings of hopelessness, loss of drive and interest, and anxiety, along with various physical symptoms. Healthy mood can be affected by many factors, including genetic predisposition, certain psychological factors and neurophysiological changes - specifically deficiencies in important neurotransmitters like serotonin. 5-hydroxytryptophan (5-HTP) is formed in the nerve cells from the essential amino acid L-tryptophan. With the help of a special enzyme, 5-HTP is then transformed into serotonin. Maintaining healthy serotonin levels is necessary to ensure that other important neurotransmitters work together properly in the brain. In addition to being a neurotransmitter that helps transfer signals between nerve cells, serotonin also influences arterial contraction, supporting the body’s maintenance of blood pressure within normal ranges. Serotonin also works to dilate blood vessels in skeletal muscle, helping to maintain healthy blood flow and ensure optimum blood supply to the muscles. As described above, less-than-optimal serotonin levels may contribute to feelings of anxiety and/or difficulty maintaining a healthy mood. Because serotonin also influences things like the perception of pain, appetite, and bowel peristalsis, those suffering from less-than-optimal serotonin levels may experience additional physical symptoms as well. Healthy serotonin levels can be negatively affected by diet, as well as by certain medications. Unfortunately, simply supplementing with serotonin will not address less-than-optimal serotonin levels because it can’t cross the blood-brain barrier. Therefore, serotonin precursors like L-tryptophan and 5-HTP are often used instead. Although both are also present in food, they don’t exist in sufficient quantities to significantly effect serotonin levels. Supplementing with 5-HTP alone is a tactic that has been used successfully for a number of years, but 5-HTP must be taken several times a day in order to achieve the desired physiological effect. Conversely, supplementing with L-tryptophan alone is also not an optimal solution, because when taken in large quantities it’s metabolized and degraded in the liver by a process called the kynurenin degradation pathway and not transformed into sero­tonin. Tryptochron® is a dietary supplement that combines L-tryptophan, 5-HTP, and vitamins B3 and B6 in a patented formulation that ensures delivery of an optimum supply of both L-Tryptophan and 5-HTP. This unique preparation provides quick-release 5-HTP with slow-release L-tryptophan to rapidly facilitate the enzymatic transformation process leading to the formation of serotonin while at the same time allowing the slow-releasing L-tryptophan to be transformed into 5-HTP and subsequently serotonin, avoiding the degradation caused by the kynurenin degradation pathway in the liver. The result is that optimum levels of serotonin may be consistently maintained. Vitamins B3 and B6 support these processes by helping to inhibit the kynurenin degradation pathway. Maintaining Healthy Mood: A placebo-controlled rando­mized study demonstrated the excellent efficacy and tolerability of Tryptochron®. 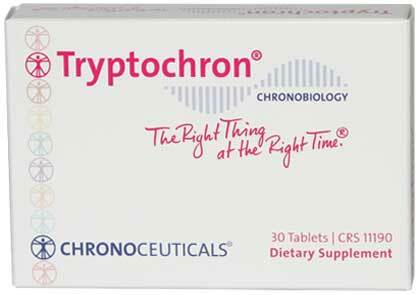 The study also showed Tryptochron® to be more effective than taking regular 5-HTP or L-tryptophan alone. Minor Tension-related Pain: Because less-than-optimal levels of serotonin can affect perception of minor pain, supplementing with Tryptochron® may help soothe minor discomfort associated with stress or tension. Occasional Sleeplessness: Because serotonin can be transformed into melatonin in the body, Tryptochron® may help ease occasional sleeplessness. Maintaining Healthy Appetite: Tryptochron has been shown to help maintain healthy appetite, which may support healthy weight maintenance. Other Ingredients: Microcrystalline cellulose, calcium phosphate, hypromellose, magnesium stearate, sodium carboxymethylcellulose, magnesium silicate, silicon dioxide, blue #2. Dosage: As a dietary supplement, take 1 tablet in the morning with 8 ounces of water.